I don’t care who you are … Democrat, Republican, or Independent … liberal or conservative … blue state or red state ….. you have to be appalled at the sheer gall of this woman! This is QUEEN PELOSI’S NEW JET!!! And the Democrats talk about Sarah’s dresses??? Queen Pelosi wasn’t happy with the small USAF C-20B jet, Gulfstream III, that comes with the Speaker’s job … OH NO! 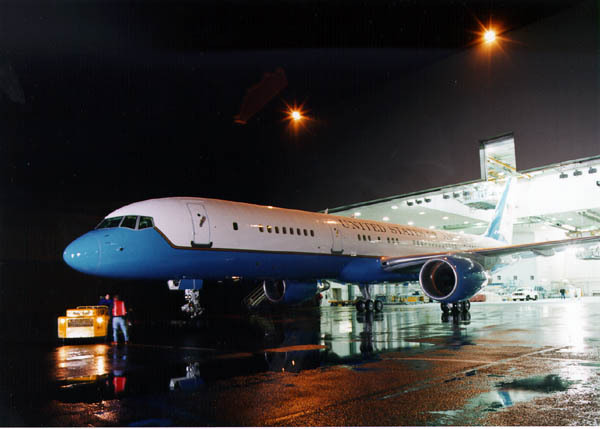 Queen Pelosi was aggravated that this little jet had to stop to refuel, so she ordered a Big Fat, 200-seat, USAF C-32, Boeing 757 jet that could get her back to California without stopping! I understand that a former Speaker of the House, Newt Gingrich, flew commercial most of the time. Many, many legislators walked by and grinned with glee as Joe informed everyone of what Queen Nancy’s Big Fat Jet costs us, the hard working American tax payers, literally thousands of gallons of fuel every week. Since she only works 3 days a week, this gas guzzling jet gets fueled and she flies home to California every Friday and returns every Monday, at a cost to the taxpayers (YOU and ME are those taxpayers!) of about $60,000, one way! As Joe put it …”unfortunately we have to pay to bring her back on Monday night and that costs us another $60,000!” Taxpayers, that is $480,000 per month and that is an annual cost to us of $5,760,000!!! No wonder she complains about the cost of this war … it might cramp her style and she is styling on my back and yours. I think of the military families in this country doing without and this woman, who heads up the most do-nothing Congress in the history of our country, keeps fueling that jet while doing nothing. Queen Pelosi wants you and me to conserve our carbon footprint. She wants us to buy smaller cars and Obama wants us to get a bicycle pump and air up our tires. Who do these people think they are??? Their motto is … Don’t do as I do … JUST DO AS I SAY! And on top of that .. now she wants to tax our IRA’s & 401K’s! PASS THIS ON IF YOU CARE ABOUT ANYTHING AT ALL!